Van Gogh’s religious beliefs, his connection with Mother Nature, his appreciation of manual laborers & his desire to help people find comfort have produce this masterpiece ‘The Wheat Field’ painting. We have roped in some of the best painters to create masterpieces that we have listed out on our website. They have put in efforts to study the styles and techniques of Van Gogh to make sure they can reproduce his paintings perfectly. 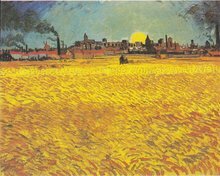 Van Gogh was in Saint-Paul Hospital when he worked on the Wheat Field series of paintings. He could see the fields from the window in his cell. 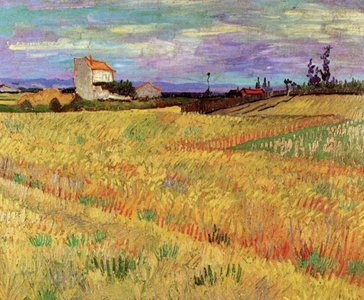 The field of wheat was enclosed by a wall and beyond that he could see the mountains of Arles. 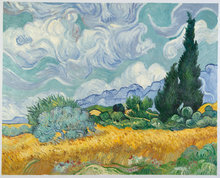 The series contained about twelve paintings, all of which had the distant mountains and the view of the enclosed wheat fields. The stone wall worked like a picture frame for Van Gogh, which let him display the wheat field in changing colors. As per Van Gogh these paintings were not made to display his talent but to express his sincere feeling. He felt indebted to the world and wished to leave something back in the form of paintings or drawings. This was out of sheer gratitude that he felt for what this world gave him throughout his life. He wanted to get away from the ills of city life, which is why he moved to Paris from Arles. Here he worked in the fields among the laborers and added value of rural toil to his art as well as life. 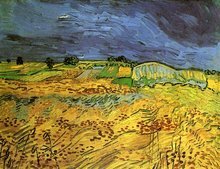 This series of wheat field paintings according to Van Gogh was the only way he could symbolize his love for nature, appreciation for manual laborers and his spiritual beliefs.